The anti-theft wheel bolts can only be removed/tightened with the aid of the adapter » page 158, Vehicle tool kit. Remove the cover from the anti-theft wheel bolt. Insert adapter B » Fig. 144 with its toothed end fully into the inner toothing of the anti-theft wheel bolt A to the stop so that only the outer hexagon projects. Push the wheel wrench onto the adapter B up to the stop. Loosen or tighten the wheel bolt » page 160. After removing the adapter, replace the cap on the anti-theft wheel bolt. Have the tightening torque checked with a torque wrench as soon as possible. 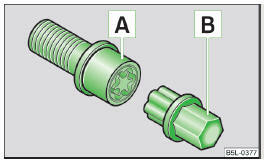 We recommend that you always carry the adapter for the wheel bolts with you in the vehicle. It should be stowed in the vehicle tool kit. The anti-theft wheel bolt set and adapter can be purchased from a ŠKODA Partner.